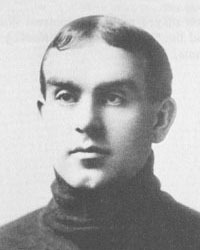 Frederick Wellington Taylor began playing hockey at the age of twelve, going on to be inducted into Hockeys Hall of Fame in 1947 after playing two Stanley Cup championship games in 1909 and 1915, and scoring 205 goals over a twenty-one year career between 1902 and 1923. During his professional hockey career he also was employed by the Immigration Department. He eventually retired as Commissioner of Immigration for British Columbia and the Yukon Territories. An active member of the Vancouver community, he was president of the Pacific Coast Hockey League in 1937 and helped form the British Columbia Hockey Benevolent Society, where he served as director from 1954 until his death in 1979. Grand Lodge of British Columbia and Yukon records. Elsewhere noted as born 1885/06/23.